Time couldn't go fast enough this Mandela Day (18 July 2016)! 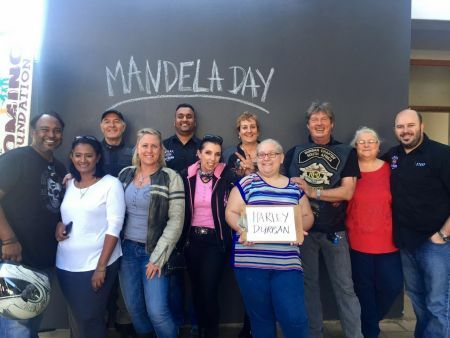 At 1 o clock, a team from Harley-Davidson® Durban and the Durban H.O.G. Chapter, roared on down to Church of the Good Shepard to make 300 sandwiches in 67 minutes for the less fortunate! This "Sarmie Stack" is an initiative by the Domino Foundation as part of their Mandela Day participation. The Domino Foundation organizes the Sarmie Stack" venue, utensils etc., and any organization that would like to participate, purchases their own ingredients and brings a team on the day to make the sandwiches. Thankfully the weather was perfect and everything ran smoothly! We had an awesome time giving back to our community and connecting with other like-minded people in our area! Thank you very much to the amazing volunteers from our H.O.G. Chapter as well as the Domino Foundation for organizing a really professional set-up. Lastly, a big thank-you to Church of the Good Shepard for letting us use their premises for the "Sarmie Stack"!